Friday and Saturday I made a road trip and decided to play tourist on the way to my destination. I was amazed with what I saw when I began to look at familiar surroundings with a fresh perspective and when I did some internet research for this post, I learned even more and developed a deeper appreciation to those who carved a road through the canyon and, in places, through solid granite. 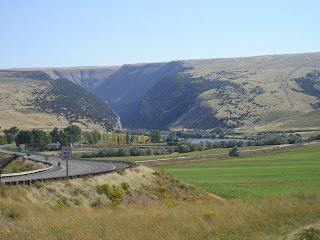 The photo at left is the north end of the canyon, just outside of Thermopolis, WY. Note the cyclists near the highway sign. They were on a tandem bike. According to J. Tom Davis' book Glimpses of Greybull's Past, the highway took two years to build, and the first automobile went through Wind River Canyon in early 1924 . 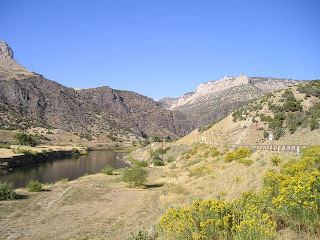 I don’t know how many times I have traveled the 12 - 14 miles through Wind River Canyon, perhaps hundreds. I have traveled this stretch of the highway in a school bus for athletic, music and field trips in my childhood and later as a teacher. I have driven the route in a car, and even traversed it on a passenger train before that service was stopped. Even though this space was familiar to me, I would not say that I was ever completely comfortable on the trips. 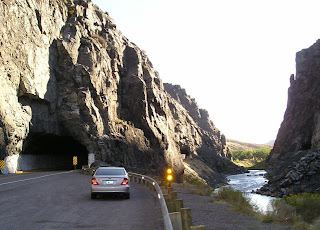 I have learned to have respect for the road through Wind River Canyon. The road follows the course of the Wind River and twists and turns: sometimes with wide gentle curves and others narrow and sharp. Drivers who think they can navigate the road at “normal” highway speeds can end up dead or in the river. The roadway was declared a Scenic Byway by the State of Wyoming, and it lives up to that distinction. 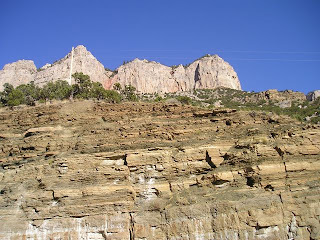 The canyon walls tower above vehicles, and shadows highlight the erosion marks and the rugged crags of rock. The walls are, at times, over 2,000 feet above the pavement. Sunlight is a rarity in the winter, and a wise driver gives the canyon even more respect during the winter months and always checks the road reports. Of course, the highway department closes the road when conditions are less than ideal. Want to see what the road can look like in the winter? The canyon has three tunnels in close succession. These are cut from solid granite that is a dark brown, almost black. You can see the second tunnel in the photo. The entire canyon would make anyone with an interest in geology salivate. The Wind River created the canyon in the Owl Creek Mountains and the geology formations are from the Triassic period (208-245 million years old) to the Precambrian period (570-2900 million years old). The cliffs cut through time intervals of billions of years and represent each major geologic period. 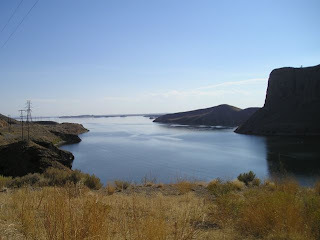 At the south end of the canyon is Boysen Reservoir and a hydro-electric plant. The water from this reservoir supplies irrigation water for the Big Horn Basin. The Wind River flows north out of this reservoir to Thermopolis. Just outside of the Thermopolis city limits, the Wind River becomes the Big Horn River. This area is called “The Wedding of the Waters.” You can read more about this historic event and modern day recreational activities here. I urge you to become a tourist in your own area. You will be surprised at what you learn, and you'll have a lot of fun doing it. Outside My Window. . .the street is slowly coming to life. Neighbors rush to cars on their way to work, children sluggishly plod to school. Squirrels scamper the deserted driveways, looking for possible treats, dropped by the distracted humans. I am thinking...how much I like to linger over a cup of tea in the morning. I rarely drink coffee. In my experience, coffee is not a beverage that likes to linger. Coffee is for those in a hurry; it is a grab and go drink. Tea demands patience. I am thankful...that I had a safe trip on Friday and Saturday and that I connected with one more patient for the PH support group. In the kitchen...the preparations for a pot of minestrone are waiting to be assembled. I love soup and can eat it anytime of the year, but I find it especially comforting in the fall and winter months. I am wearing...khaki slacks and a black sweater. I am creating...my Christmas gift list and checking it twice, just like the big guy. I have one more gift to make and the list will be complete. I am going...to volunteer at the hospital again this morning. If I make one person's day a little less stressful, just one person, then my shift will be worthwhile. I am reading...The Kite Runner by Khaled Hosseini. Actually, I am listening to the book on CD's while I knit. I am on disk #7. I am hoping...to get back on a weight loss plan. I don't understand why I can doggedly focus on projects that involve other people and be successful, but this one thing for myself I always fail. I am hearing...the timer beeping, reminding me it is nearly time to leave for my shift. One of my favorite things...a ruby ring that my mother gave me for Christmas. It was such an unexpected gift. I need to wear it more often, but I don't wear a lot of jewelry, never have. A Few Plans For The Rest Of The Week:sprinkling system to be winterized, finish another pair of socks, knit on three Oddball blankets that should be arriving by Friday. Find beauty in your surroundings. ~If you'd like to particpate in The Simple Woman's Daybook (each Monday), you can visit The Simple Woman's blog here. To get instructions for particpating, click on The Simple Woman's Daybook icon in her sidebar. This afternoon I was reading the new issue of all you, a magazine that I really like. It has fresh ideas, attractive layouts, short informative articles, and good tips. The October 24, 2008 issue has a great tip on page 146 that explains how to stop receiving unwanted catalogs. Many of the catalogs I receive go immediately into the recycling bin. This unwanted mail is a huge waste of paper and the Postal Service's time. From the article, I easily unsubscribed to many of the unwanted catalogs on Catalog Choice. If you are tired of the clutter and want to do your part to preserve the forest, check it out. 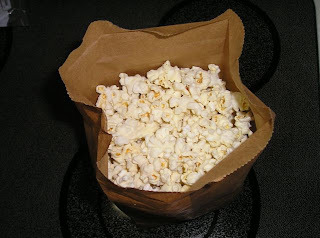 My all-time favorite snack is popcorn: I readily admit that I am addicted. I can eat popcorn everyday, at anytime. When I go to the movies, I always buy a bag of popcorn, and when I have the opportunity to attend a movie with my sister, she wants to buy a bigger bag (that is refillable) and share, but I refuse. I don't like to share popcorn. It is a treat that I give myself. Popcorn is a healthy snack choice, minus all the toppings, seasonings, and coatings. Recent studies have proven that popcorn snackers get more whole-grain than those who enjoy other snacks. While popcorn is probably the cheapest snack (at home, anyway) that a person can buy, I have discovered the best way to microwave popcorn: it is healthier than any prepackaged microwave popcorn because you do not use any oil and you can determine if you want seasoning. I am on sodium-restricted diet, so I do not add any seasoning. 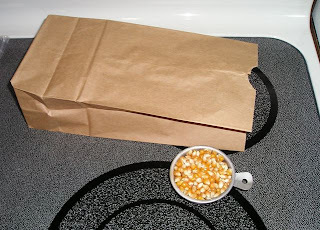 First, you will need popcorn, lunch-size kraft bags, and a microwave. Seasonings are optional. Measure the popcorn. I use about 3 oz. of popcorn (remember, I am addicted) which is about 1/3 cup. Pour the popcorn into the bag. 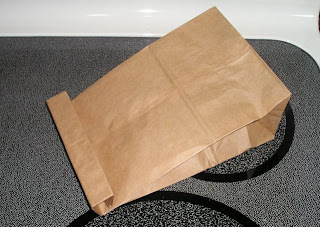 Now, fold the top of the bag about three or four times. You do not need to fasten it in anyway. 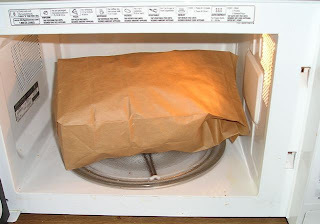 Place the bag into the microwave with the fold side down to help secure it. I have a popcorn setting on my microwave, so I just press that and wait. You will need to experiment on the amount of time your microwave takes; mine is about 2 1/2 minutes. Listen as the popcorn pops and when it begins to stop popping, stop the microwave and open the door. Remember that the contents of the bag is very hot. 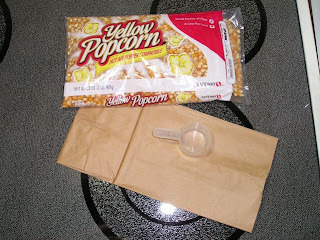 I always shake the bag a few times so the unpopped kernels fall to the bottom. Open the bag and enjoy your treat. I eat mine right out the bag. Bonus: no dishes or pans to wash. 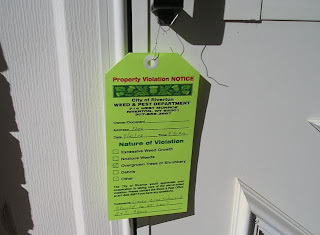 When I returned from my volunteer shift at the hospital yesterday, I found a surprise on my front door - a neon-green tag declaring my trees are violating a city ordinance. It appears they need a haircut, as their branches are lower than the city mandated 8 feet. I must have jinxed the trees earlier this week when I boasted to a friend how healthy they were this year. She was concerned about one of her trees, and I recommended the arborist that had pulled one of mine back from the brink of sure death. I called Cedar Mountain Tree Care and asked to have a crew come by and trim the trees. I told the receptionist they were probably due for a thinning, too. I hate to do this because they were so pretty this year, but Caesar has wished it, and I must comply. My only comfort is that by thinning the branches the tree will remain healthy. Outside My Window. . .the sun is slowly slipping over the horizon, hesitant to begin its day. As the days get shorter, I have been waking later and later, too. I am thinking...about the economy. Generally, Americans are spoiled and do not realize that we are our own worst enemies and that the country has been crumbling from within for a long time. We spend more than we make because we want the newest gadget or automobile. We confuse want with need. I fear another Depression is in our future. I am thankful...that my house and car loans are paid. I am thankful that I have no debt and that I have invested my money in a variety of places. From the kitchen...I need to start planning weekly menus; perhaps, that will help me eat healthier meals and minimize snacking. I am wearing...a denim skirt and tee shirt. I am creating...a twined rug to give to my sister for Christmas. I am going...to volunteer at the hospital this morning. I "work" the front desk every Monday morning. While there, I help guide patients to hospital departments, serve coffee, and assist the admissions office by welcoming patients. Somedays if patient traffic is slow, I do a lot of knitting. I am hoping...to get all of my Christmas gifts made by the middle of October. I am hearing...two squirrels chattering as they spiral around the trunk of one of my trees. Around the house...are items my sisters made by crocheting, quilting, cross stitching, and sewing. One of my favorite things. . .my Knit Picks Options interchangeable needles. 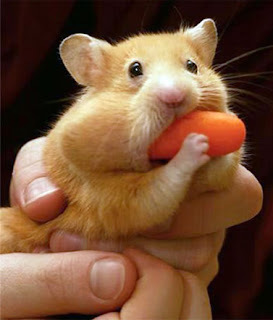 Remember: Don't bite off more than you can chew! Spend your earnings wisely: you and your children do not need the newest and latest gadget. Although it may strike some as being old-fashioned, let this be your guide: Use it up; wear it out; make it do, or do without. 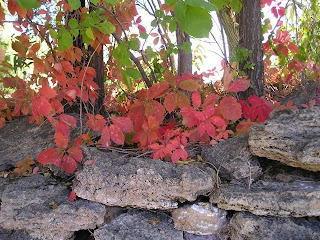 Yesterday, I noticed the backyard, ash tree is changing color very quickly. Some cast-offs are beginning to clutter the lawn. 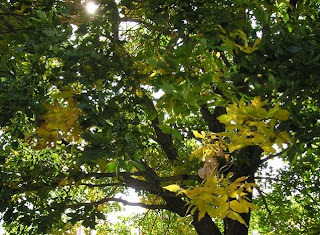 Ash trees turn a lovely yellow, and when the entire tree is golden, the sun filtering through the leaves shimmers and covers everything a blanket of gold. Lovely to see, but so short-lived because the ash do not hold on to the transformed leaves long. They shower to the ground and too quickly dry out and turn into curled and brittle shells. I have three trees in my yard, all ash. They are usually the last trees in the neighborhood to leaf in the spring, and the first to lose their leaves in the fall. 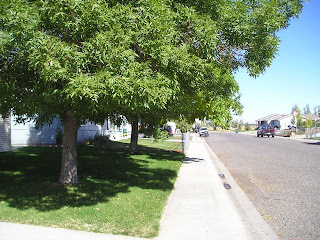 My neighbors and I enjoy their shade in the summer, and because they provide such wonderful shade, I endure the billions of seeds the tree in the front discards in the lawn, on the drive and walk, and in the street. Keeping a tree healthy in Wyoming takes some work and dedication. Ash trees are susceptible to scale and all sorts of bugs, but thanks to a great local arborist, I have managed to keep the trees healthy. I nearly lost one of the front trees about eight years ago, but he pulled it back from the brink. The trees have grown since I purchased the house in 1993, and are the tallest trees on the block. I hope they continue to prosper. Recently, life has managed to get in the way of my knitting. It seems like I have been running from one task to another and not getting much done. Last weekend, I was busy getting ready for the Wyoming Pulmonary Hypertension Support Group meeting, and this week, I hustled to get the group newsletter ready for publication and distribution. (I'll write more about this group later.) I've met three friends this week for two separate luncheons, and begged out of a quilting group gathering today. My laundry piles are high, I have dishes in the sink, the floors need vacuumed and the furniture dusted. I needed to stay home and get something done. In between all of this activity, I knit on an Oddball Baby Blanket and an Oddball Shawl. Angel Wings made its return visit, and I added another section. 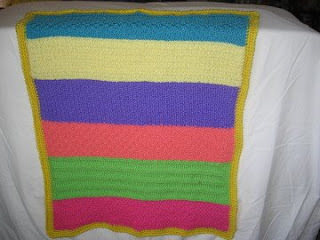 The Oddball Baby Blanket, Tropical Plantation, was started by a lady in Hawaii. She used the bright pink, which reminded her of a Hawaiian flower. 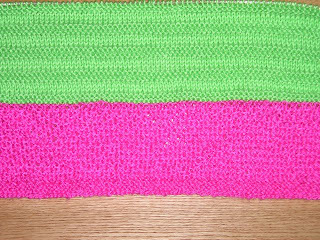 I added the lime because it was the only color I had in my stash that resembled the tropics. I rarely purchase yarns to work on these projects because the reason I joined the group was to decrease some of my stash. 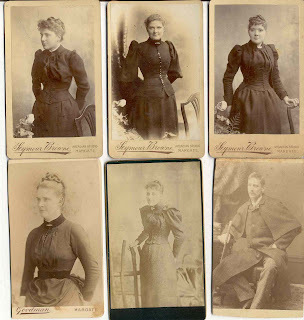 So far, I have been successful in finding a yarn that coordinates with the theme of the shawls or blankets. Outside My Window. . .the trees appear tired and weary with the burden of their leaves. Near the crown, the foliage has a slight tinge of gold. Soon, the ground will be littered with the castoffs and the barren branches will sigh with relief. I am thinking...that I had better get busy and winterize my yard before the cold weather decides to settle in. It is a chore that I dread, but one that is necessary. I am thankful for...my ability to find things to occupy my hands and mind. I am thankful that I can use my talents to create things for people in need. So many of people claim to be "bored," but I think they are just boring. From the kitchen...rows of gleaming, mason jars are waiting to be stowed in a box for Christmas gifts. Twelve pints are filled with apricot jam. Seven quarts contain crab apple and plum juice for making future batches of jelly. I love capturing the taste of summer to be enjoyed in the dead of winter. I am wearing...some ugly knee-high compression stockings. My body is retaining too much fluid, and they help to reduce the swelling in my legs. I am creating...a pair of socks. I inherited the yarn and the finished ribbed cuff of one sock from a friend who decided she doesn't like to knit socks. The yarn is soft and is striping nicely, but I understand why she did not like to knit with it: the stitches slide too easily off the needles. I am going...to lunch with two old friends tomorrow. We try to meet at least once a month to chat and to stay connected. I am reading...The Kite Runner by Khaled Hosseini. Actually, I am listening to the book on CD's while I knit. I am hoping...the leaders we elect in November will bring Americans together. I am hearing...the steady ticking of the clock, hanging on the wall. It is comforting. Around the house...are piles of books and magazines and papers. I need to try to bring order to the chaos. A Few Plans For The Rest Of The Week: a dental appointment for a routine cleaning, knitting night at the public library, lunch with old friends, finish the support group newsletter and send it to the members. Learn all you can about your ancestors and share that knowledge with your children. September and cooler temperatures blew into Wyoming last night. The house shuddered from the wind gusts, and this morning the lawn was littered with fallen leaves and branches. A light rain fell periodically all day, and now the sun is shining. I knit my way through the dreary day and listened to Tall Grass by Sandra Dallas, a book that I highly recommend. The reader (or listener) feels like a member of the Stroud family. I was drawn in by the description of the farmhouse and the surrounding fields. It brought back memories of my childhood and my family home. The narrator is a young girl that the dad calls, Squirt. She is much like Scout in To Kill a Mockingbird. Tall Grass shows how a Japanese internment camp brings out the best and worst in its community. 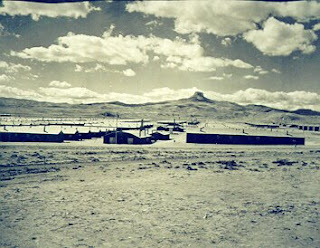 Wyoming also had an internment camp during World War II, and I am sure the communities surrounding Heart Mountain went through the same struggles as those in the community in this book. This page gives you an idea of camp activities and some of the conditions at Heart Mountain. While a part of me understands why the leaders during this time period felt the need to build the camps, I am ashamed of the camps and how the Japanese Americans were treated. Many people are not aware that these camps existed, and others chose to ignore their existence. I am saddened that Wyoming played a role in these historical camps. 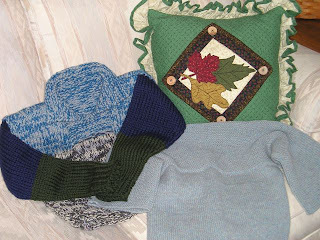 I completed two wool sweaters for the fall afghans for Afghans Youth Campaign and will mail them tomorrow. While listening to Tall Grass and knitting, I prayed that the recipients of the sweaters would be protected from war and from the ignorance of prejudice. World Peace is possible, and we each have a role to play.